Ten of Cups (R) says a highly charged situation has gone wrong and you are experiencing “burn-out” because you have chosen to turn your emotions inward against yourself rather than expressing them. This denial of your “inner” self is producing feelings of anger and deceit which are blinding you to the happiness life can offer you. The rainbow represents a promise – the actuality has to be worked for. You need to clearly envision your dreams of social harmony, global coexistence and your personal hopes for a happy family if you wish them to be realized. When the situation surrounding you is causing depression or sadness – do not worry – time will heal your aching heart, soon the sadness will depart. When you have experienced the terrible feeling of being “let down” – it suggests that your feelings have been hurt by the thoughtless actions of others – actions which have caused tears. Try not to “analyze” so much – be more spontaneous – allow your “inner” emotional contentment to radiate out in all aspects of your life and you will know satisfaction. There can be serious problems with your emotional “families” – they may be strong, but they may not be correct or productive. A family or group may be smothering or in other ways taking advantage. The emotions of the group may be healthy within the group but may be too self-serving in the bigger picture. In the first position: This calls on you to help others achieve this archetype, whether in your own family or in society at large, while hanging on to the principles of love you have already digested. In the second position: You may be too dependent on others, or they on you, strapping you for resources at this time. In the third position: This may be more than you have expected. Or, it may be less than you had hoped for, or with a twist of some kind. In the fourth position: At one extreme, the promise of love as the solution, the panacea of all the world’s problems is somewhat distorted, most likely over-idealized. Some facet of your emotional package-your marriage, your family, your creative project-may be seen too much as an end rather than a means and part of a much larger continuum. In another extreme, the ideal of universal love and its perfection may be hindering you on the more personal level. In the fifth position: You may be over or under evaluating the moment, A break in the emotional long-run may be contemplated. You may be sensing the end of a major cycle with many factors completely out of your control. In the sixth position: The early achievement of a lifetime goal for your heart may stretch relationships and creativity in ways not anticipated. Likewise, for the disappointment of seeing a long-term goal disappear into impossibility. There may be a lack of support here for your emotional/creative goals. In the seventh position: You may actually fear the forces operating within the structure of family, or in a creative legacy bound up with your strong talent. This is the onus of responsibility not to disappoint others, much more than a concern for self. There may be a lack of encouragement here, particularly for mental work. 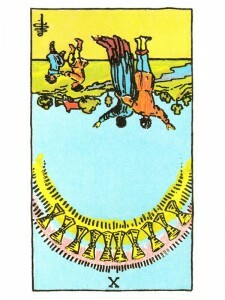 In the eighth position: The events affecting your emotional/creative house may have overshot the mark, or fallen short. In the ninth position: This is emotional/creative reward time, however you will need to remain focused on your goals to achieve the results you hope for during this emotional/creative time. In the tenth position: The emotional goals toward which you have been working will take on a new light. There are new factors which will change the chemistry of this plane. Ten of Cups (R) in the ninth position: This is emotional/creative reward time, however you will need to remain focused on your goals to achieve the results you hope for during this emotional/creative time. Can you tell what the ten reversed in the ninth position means? There is nothing there.